The GUI is an Oracle Java technology-based standalone user interface. The GUI needs to be started on the same machine under test that has the VTS kernel running. The GUI does not allow remote connection. Lists the tests that are registered with the host machine. The Tests tab is associated with the Test Group View, and the Logs tab is associated with the log view of the software. The host machine name can be viewed at the top of the page. Displays the tests registered with the host. 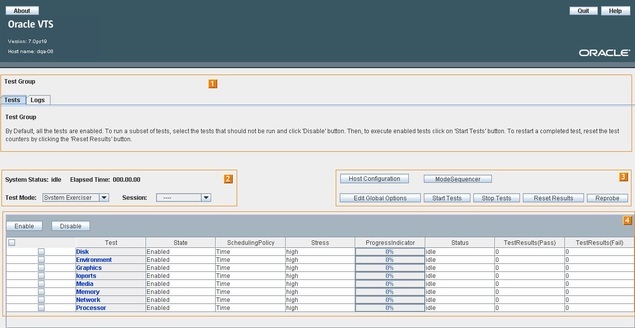 You can set the testing modes, schedule the tests, and monitor the testing status of each of the tests. Host Configuration: Displays the details of the machine under test. Mode Sequencer: Displays the options to set the Auto Mode Sequencer to run the tests. Edit Global Options: Sets options that you can apply to all the tests globally. These options can be used to schedule the total time of the testing session. Start Tests: Starts all the tests that are enabled. By default, all the tests are enabled. To run only a particular test, disable other tests by clicking the corresponding checkbox and then clicking Disable. To start a particular test when other tests are already running, select the checkbox for the test and click Enable. Stop Tests: Stops all the tests that are started. To stop a particular test that is running, select the checkbox for the test and click Disable. Reset Results: Resets the status counters (pass, elapsed time, and error count of a test is reset to zero), and progress bar to an idle state. Before starting a new test session, click Reset. Reprobe: Reprobes the system for devices currently available. Enable: Enables all the selected tests. To verify which tests are enabled, look for the state of the tests under the State column corresponding to the test. Disable: Disables all the selected tests. To verify if a particular test is disabled, look for the state of the test under the State column corresponding to the test. Test: Tests can be any of the following: Memory, Disk, Removable Disk, Network, HBA, Graphics, Processor, IO ports, lnterconnect and Media. Click on the test link to set the test options, namely: stress level, scheduling policy (time-based or in terms of test passes) and error limit. State: Displays the state of the test at a given time (enabled or disabled). Scheduling Policy: Displays the scheduling policy selected for the test, whether Test Time or Test Pass based on the testing requirement. Stress: Displays the stress level at which the test is running (low or high). Progress Indicator: Indicates the percentage of test run completed. A tool tip over the progress bar shows the progress of the test in percentage and the current state of the test. Status - Displays the status of the test being viewed. Test Results: Displays the test results in two columns. The first column displays the number of test errors and the second displays the number of test successes.